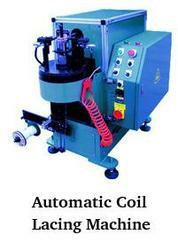 Leading Manufacturer of automatic coil lacing machine from Faridabad. We are presenting Automatic Coil Lacing Machine to our valued clients. It is used extensively in diverse industries. We use the best grades of basic components and manufacture this by adhering to prescribed protocols of the industry. It is provided with sturdy casters for easy mobility and manufactured by using state of the art technologies. Our clients an avail this at leading industry rates. Looking for Automatic Coil Lacing Machine ?